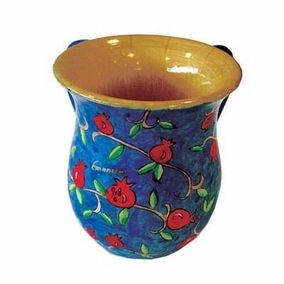 Pomegranates Netilat Yadayim Cup (Medium) CAT# NYS - 8 .The rabbis of the Talmud derived the requirement of washing the hands as a consequence of the statement in Leviticus 15:11. And whoever he that hath issue (a Zav, ejaculant with an unusual discharge) touches without having rinsed his hands in water, he shall wash his clothes, and bathe himself in water, and be unclean until the evening. and from Psalms 26:6. I will wash my hands in innocency; so will I compass Thine altar, O LORD. The Talmud inferred the specific requirements of hand-washing from these passages. The general Hebrew term for ritual hand washing is netilat yadayim, meaning lifting up of the hands. The term "the washing of hands" after evacuation is sometimes referred to as "to wash asher yatzar" referring to the bracha (blessing) said which starts with these words. Halakha (Jewish law) requires that the water used for ritual washing be naturally pure, unused, not contain other substances, and not be discoloured. The water also must be poured from a vessel as a human act, on the basis of references in the Bible to this practice, e.g. Elisha pouring water upon the hands of Elijah. Water should be poured on each hand at least twice.